The vaquita, or the Gulf of California porpoise is the most endagnered species of porpoise in the world. (Photo by Thomas A. Jefferson). The vanquita (Phocoena sinus) is the smallest species of porpoise in the entire world. Although the vaquita resembles the common harbor porpoise, they have longer pectoral fins, a tall, triangular, dolphin-like dorsal fin, little or no beak, and are evenly grey on the back and lighter on the sides with no sharp demarcation between the colors. Males may grow around 4.9 feet long with females being larger at around 4.11 feet long while animals of both genders may weight around 120 pounds. Fossil records tell us that this endagnered porpoise evolved from an ancestral population of harbor porpoises that moved northward into the Gulf of California region during the beginning of the last Ice Age around 1 million years ago. The vaquita can only be found in the Gulf of California. (photo is public domain). As the only species of porpoise to be found in warm waters of the eastern Pacific, the vaquita in found only exclusively in the northwestern corner of the Gulf of California. From confrimed observations, they have been known to only swim in water that is less than 130 feet deep within 25 miles offshore. Although they are found at open sea, they are generally found in shallow areas that are less than 6 feet deep at low tide, including straits and sea bays. 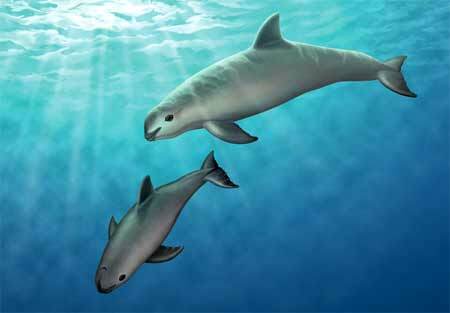 Fossil records tell us that this endagnered porpoise evolved from an ancestral population of South American Burmeister’s porpoises that moved northward into the Gulf of California region during the beginning of the last Ice Age around 1 million years ago. The vaquita is usually sighted either alone or in small pods that are up to seven animals. Vaquitas are normally solitary animals that can sometimes be seen in pods of up to 2-7 animals although reports of them living in pods of 10 have been reported. However, unlike most other cetacean species, they do not apporach vesasels and are generally undemonstrative at the surface, only emerging briefly. Yet because of this behavior, vaquitas can be effectively surveyed only when conditions are ideal of calm winds and good lighting. Because theyare so elusive by nature, the vaquita is very diffcult to observe. 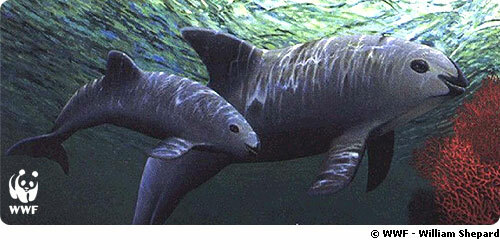 Although little is known about the life cycle of the vaquita, their gestation period is around 11 months. Little is known about the breeding cycle of the vaquita but researchers tell us that it’s similar to that of the harbor porpoise in most respects. If so, then their gestation period is likely around 11 months and they may sexually mature at around three to six years of age. From what researchers know, most calves are born in late winter and early apring (February-April), with a peak in late March and early April. During her 22-year lifespan, a female vaquita may have one calf every two years. The vaquita is endangered due to fishery conflicts and accidental byctach. While there are no records of the vaquita ever being subjected to whaling, they have victimized bu commercial fisheries since the 1920’s. The large-mesh gillnets that are used to catch large fish such as tuna and totoabas have proven to be fatal to the vanquitas as it has to other cetacean species. As a result, the entire population has rapidly declined by around 8% each year as these nets continue to kill more porpoises than are born. In the 1970’s, the Mexican government banned commercial totobas fisheries , but illegal fishing still continues along with gillnetting for sharks and rays. 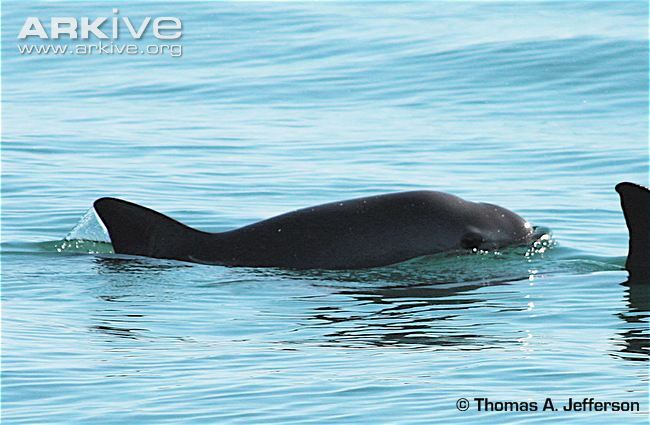 It’s estimated that around 245 vaquitas are left in the entire world. If prompt progress is not made by the Mexican government to better protect them, researchers believe that the vaquita may become the second cetacean species to become extinct during a human lifetime in the next few years. What can be done to save the vaquita? 1. Tell your friends, family, and social networking followers about the plight of the vaquita. 2. Don’t buy seafood products that came from fisheries that use gillnets. 4. 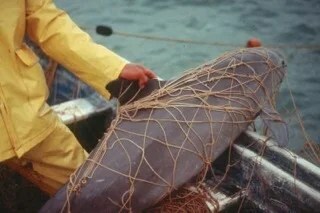 Write a letter to Congress or even the Mexican Embassy and ask them to support Mexican action to protect the vaquita.